To get more information about any weekendinvesting product straight in your mailbox, please click here. We are pleased to announce that Weekendinvesting.com has joined hands with Smallcase Technologies P Ltd to provide advisory services based on momentum investing for retail portfolios (ideal size INR 200K to 1000K) using the affordable and automated Smallcase platform. The smallcases platform is a complete DIY platform that is integrated to leading brokerages to help users manage thematic and systematic portfolios (commonly known as smallcases). These smallcases are currently available for clients of these brokerage houses viz : Zerodha Securities, AxisDirect, Edelweiss Securities Kotak Sec , Angel Blue, 5 Paisa and HDFC Securities and many other brokerages are expected to join in the future. 2. You retain full control over your money, stocks and execution. 3. You spend less than a minute per week to manage your portfolio. 4. Auto back-office accounting, dividends accounting etc are all taken care of . 5. Bench-marking of your portfolio vs the model or market indices is provided. 6. Capital addition or deletion in proportion from your portfolio is easy. 7. Creating a lump-sum or a SIP mode of investment can be done. 8. Advisory recommendations need only a single click to manage. 9. An advanced support infrastructure is ready to help when you want. Weekendinvesting has been a leading name in momentum investing products for past many years and enjoys the confidence of a large number of clients. Our core USP has remained to design and manage simple and transparent products that can deliver market beating performance and a support system that has won accolades from our users. 8. Our industry first Service Guarantee to ensure service during down years. 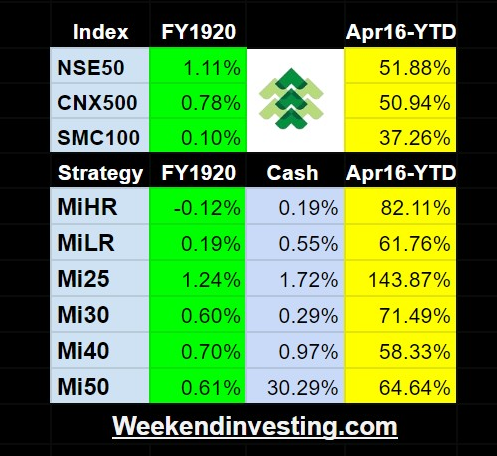 Mi_MT_Allcap – Med Term trends on All cap stocks above 1000 cr. All three products are offered individually at a 3 month Trial plan each of INR2499 (GST included) and an annual plan of INR 9999 (GST included). The annual plan carries additionally the popular weekendinvesting service guarantee. Please go through the details in the link above and /or send us mail at alok@weekendinvesting.com for any query. This FAQ will answer most of the common queries you may have.